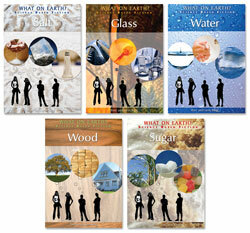 Science facts are woven seamlessly throughout this series featuring an inquisitive group of 14-year-old students tasked with presenting a video report on sugar, salt, wood, glass, and water. Tess, Nate, Sam, and Val work as a team, discovering how the science of ordinary things affects them, and how fun it is to investigate. The team follows Sam's sweet tooth and discovers how a local sugar refinery treats our environment. The friends learn how art and recycling are related, and Tess gets to try her hand at glass blowing. The team finds wood all around them, and Nate investigates why some trees are missing from the forest. The team learns what salt does for food and finds pink salt down in a mine. A water pipe breaks at Val's house, and the team discovers the many impacts water has on their lives.